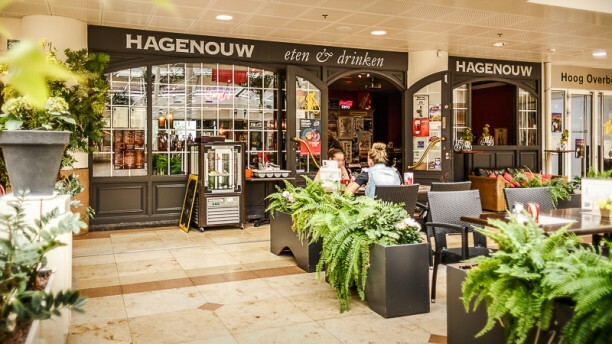 Restaurant Hagenouw Food & Drink in Utrecht is very central situated. The restaurant is located on the Godebaldkwartier in Hoog Catharijne, near the entrance of Moreelsepark. There is a cozy warm atmosphere and it's a good spot for a drink, dinner or small bites after a day of shopping/ working. Hagenouw ligt op ca. 100 meter afstand van Utrecht Centraal station. U reist met alle treinen, bussen en trams naar Utrecht Centraal. Vanaf daar loopt u in 2 tot 6 minuten naar ons. Seriously good food right next to Utrecht Centraal! A really nice surprise, and the service was super friendly! Highly recommended! Heel fijne bediening, lekker eten. ???? Alles was super. gezellige bediening . Het was met 1 woord Geweldig eten. The restaurant was quiet. The waiters were nice. The dishes are quite big. The tomato soup is very good. The wienerschnitzel is also good. As the chocolate tart. Het was weer erg lekker en voor herhaling vatbaar. Quick friendly service, good food...the main meals have big portions. Great place to grab a meal before catching the train from Utrecht and with the 20% off it makes it real value for money. Portions were generous, food was good. Recommended for a dinner after doing the shoppings.